In the winter we took the time to remind you of the dangers of leaving your pets alone in the car in that cold season (‘Leaving Your Pets In The Car...’). Now that the weather is hot again and we begin to dread stepping into our vehicles that have been sitting out in the sun in that anticipation of a sweltering smack in the face, it is time to revisit the issue. When it’s hot out, never leave your pets inside the car. We often think about protecting ourselves and our children, but we must also remember to safeguard our family pets from similar fates. The Ontario SPCA released this document for reference on this very topic, ‘Facts On Dogs And Heat’. In a frightening statistic, temperatures of just 22°C / 72°F outside of the car can rocket up to 47°C / 117°F in a mere 60 minutes (www.rspca.org.uk). Because our pets do not sweat, they are even less able to cope with extreme hot temperatures than we are. Heat stroke is swift to set in, leading to a number of deaths each year. Don’t assume that because the windows are down that your pet will be safe as this does not provide sufficient ventilation, nor does parking in the shade keep the vehicle cool enough. 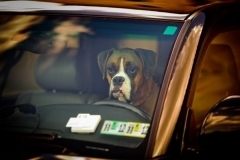 The risks for your pet are just too severe, do not leave your pet in a parked car. For more information on heat stroke and how to keep your pet cool and safe in the summer months, contact your veterinarian today.